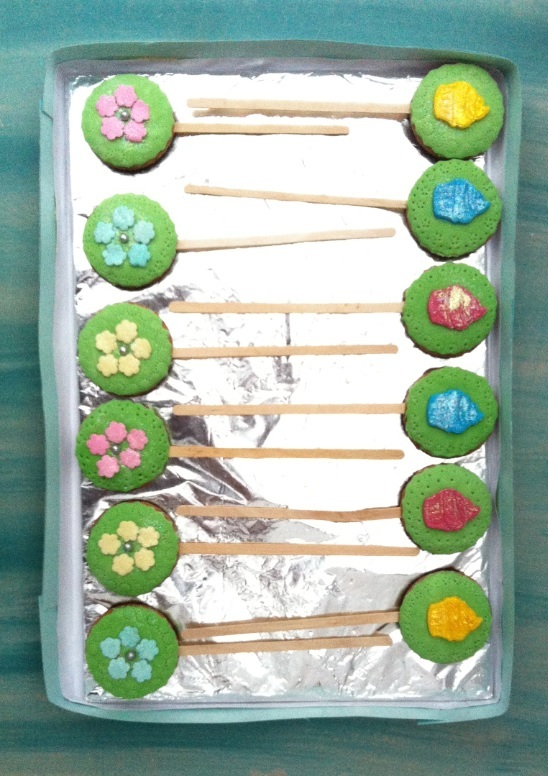 Mother’s Day is coming up and these little beauties I made with my 5 year old niece little M for her to give to her mum for mother’s day.This is a simple idea for children to make for Mother’s Day, there is no cooking involved and the results are really pretty. 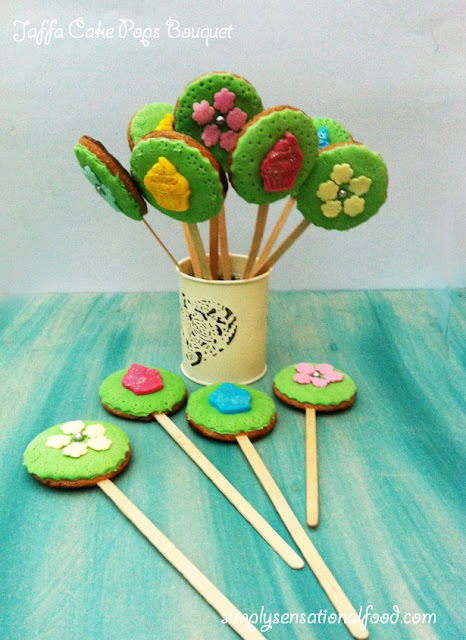 A beautiful edible flower bouquet for Mother's day. 1.Using the point of a knife, poke a hole in the bottom of the Jaffa cake and push into the hole the wooden coffee stirrer to make Jaffa cake lolly. Do this for all 12 Jaffa cakes.2 Roll out the green fondant and cut out 12 circles of green fondant using the round cookie cutter. The cutter should be same size as Jaffa cake.3.Brush the non-chocolate side of Jaffa cake with warmed apricot jam and stick the green fondant circle over it.4. Roll out the pink and yellow fondant icing and cut out cupcake shapes and flowers, stick them to the green fondant covered side using a little water. Repeat for all the 12 Jaffa cake pops.5.Arrange the Jaffa cake pops in a pretty vase and they are ready for gifting. Also A big thankyou to the kind young man in Costa coffee that gave us the stirrers for the pops. When I babysit my niece we always try and make things she can take home with her that is easy to create but makes a lovely gift. This is an amazing idea! I never would have thought of using jaffa cakes to make cakepops... Genius! What a gorgeous idea Nayna! These are so pretty and perfect for making with little ones. Another wonderful recipe idea from you miss Nayna, you continue to inspire us all. I actually tried cake pops for the first time the other day and it was delicious! Thanks Ana.They are not a "true" cake pop but still delicious. Oh what fun. I would love to recive these on Mother's day. That's a lovely idea Nayna. They are so pretty. I hope you do Rhian. These turned out really well! What a simple and delicious treat for the family. We invented them, I don't think there is any such thing!!!! This is a great idea. Never knew I could do this with Jaffa Cakes. It's a lovely idea but I must admit I cringe at the bright green. Never been a fan of coloured food. I suppose I would have to make them white, or various shades of chocolate colour, lol! I too try and keep away from added colours but my niece picked the colours so once in awhile its ok. Brilliant idea for Jaffa cake and so pretty. What a fantastic gift for Mother's day. These are such a fantastic idea! Great fun to make with kids for lots of occasions and perfect party food. You can decorate them in any theme, we made some halloween ones with white fondant and iced black spider webs. These are brilliant, what an absolutely wonderful and yet simple way to make something beautiful for the lady in your life and the perfect colours for spring too. These are fantastic - they look great and I know they will be absolutely delicious! Oh wow, these are amazing! They look beautiful and I bet they tast great too. Love them! I guess these are not to everyones taste, but they are perfect for 5 year old to make to gift to her mum. What a fantastic and cute idea!it looks so good! I might have to leave this out for the kids to see! we dont have this cookies here but i can find something similar, looks really neat and lovely. I just love jaffa cakes so much. If decorated like above then that's a double treat. Wonderful and easy idea to please mums. These look like fun to make with the kids. How fab are these!! My local sainsburys will be out of stock of jaffa cakes come tomorrow morning!! Great idea, I love jaffa cakes! Brilliant idea - Going to give these a go! Lovely idea - these look great!